Britain needs to get a grip on immigration for the sake of the country's security and good community relations, Michael Howard has said. In an interview with BBC Newsnight's Jeremy Paxman, the Tory leader insisted there had to be a limit, to manage the demands on public services and housing. But he was unable to say how many immigrants would be allowed in under his plans for an annual quota system. "We haven't got a number yet - Parliament will set the limit." During his 30-minute grilling, Mr Howard said the limit would be set after consultation with the Confederation of British Industry (CBI) and other employers' organisations. This was to ensure "we can get the right number of people coming into this country with skills, which we need, as economic migrants", he said. "We will set a number for family reunion, and we will set a number for genuine refugees. "And in that way we arrive at the annual limit." Mr Howard conceded that he had not had those discussions with business, but added that Britain should take note of the way Ireland deals with immigration. "Ireland, taking into account the number of people who can come here from eastern Europe, has reduced the number of work permits it gives out from 50,000 a year to 2,500 a year," he said. "I think there may be lessons we can learn from Ireland on this." Pressed to say what the number would be, Mr Howard replied: "I think it will be less than the number of people who come into the country today, which is about 150,000 ... I can't give you a precise figure." Mr Howard then pulled a piece of paper out of his pocket with a quote from the former Labour chancellor and home secretary Roy Jenkins, whom he described as "the patron saint of liberalism". It said: "There is a clear limit to the amount of immigration this country can absorb - and it is in the interests of the minorities themselves to maintain a strict control." Mr Howard added: "That is what I think - it is not what Mr Blair thinks. That is the difference in principle between us." Asked if the annual limit on asylum seekers would be 10,000 to 20,000, he said: "That is an illustrative figure, yes." Mr Howard was then pressed to say how he would handle the 20,001st person to present themselves, if they were, for example, a white Zimbabwean farmer who had been tortured. "If someone arrived and wanted asylum in the circumstances you have described, we would say: 'You will have to wait a little while and we'll put you into next year's quota'." Mr Howard said he could not give the location where asylum applicants would be processed, which Labour has dubbed a "fantasy island". But he said he would withdraw from the 1951 UN Convention on Refugees. "We need to bring immigration under control and we need to limit it because of the importance of community relations in this country," he said. "We need to have a proper grip on security and because we need to manage effectively the demands on public services, housing and other things," he said. "I think that although I recognise that this is a country that's benefited from immigration... there have to be limits and there have to be controls." Mr Howard insisted that if he was prime minister he would have a "good working relationship" with US President George Bush. He said a Tory government would cut taxes by £4bn in its first budget by scraping regional assemblies, regional health authorities and the New Deal. Asked if he would reverse the rise in National Insurance, Mr Howard said: "No, I'm not making any promises I cannot keep." He defended Tory health policies which would mean patients could choose their hospital or take 50% of the NHS operation price to go private. "People have paid their taxes, they have paid for the cost of their NHS treatment," he said. "If they choose to go private, the NHS should pay half of what it would have cost the NHS to pay for those operations towards the cost of their treatment in the private sector." 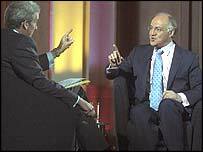 *Michael Howard will appear on The Paxman Interviews on Friday at 1930 BST on BBC One. You can also watch the interviews live by clicking on the election news in video button at the top of all BBC News website election stories.